In fall 2015 fall term, I am teaching two classes. 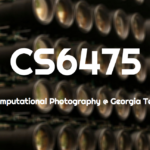 Both for the Georgia Tech’s Online MSCS program. CS 6476: Computer Vision (This class was originally developed and offered by Aaron Bobick, but as he is now a Dean at Washington University, St. Louis, I have taken over as Instructor.